Global Scientific Research Journal of Arthritis is an open access, multidisciplinary, peer-reviewed Journal that major focus is on cellular and molecular mechanisms of arthritis, musculoskeletal conditions and systemic autoimmune rheumatic diseases and translation of this knowledge into advances in clinical care. The Open Access Journal mainly covers the natural history, pathophysiology, treatment, and outcome of the rheumatic diseases. 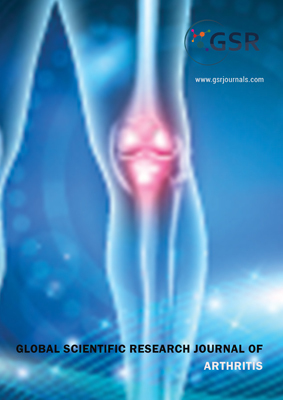 Global Scientific Research Journal of Arthritis supports and covers all aspects of rheumatology, which includes the spectrum of musculoskeletal conditions, arthritic disease, and connective tissue disorders. ARD publishes basic, clinical, and translational scientific research. Global Scientific Research Journal also brings multiple internationally peer-reviewed member journals under one roof thereby encouraging knowledge sharing, collaboration and promotion of interdisciplinary science. The Open Access Journal invites a variety of article types such as Original Submissions, Reviews, Mini-Reviews, Case Reports, Clinical Images, Short Communications, Perspectives and Editorials.